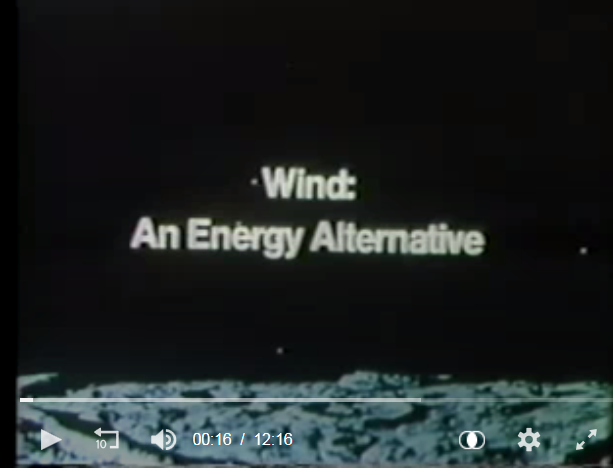 In 1980 the Department of Energy published a short film titled Wind: An Energy Alternative. The 12-minute film was produced by the Solar Energy Research Institute (SERI) probably in 1979. The film has been digitized by the National Technical Information Service (NTIS) and is made available in collaboration with the Internet Archive. At the time I was working for Vaughn Nelson at West Texas State University in Canyon, Texas. Nelson and WTSU were doing a lot of work with the USDA at the Bushland agricultural research station on Darrieus wind turbines and wind-assisted pumping for irrigation on the Great Plains. 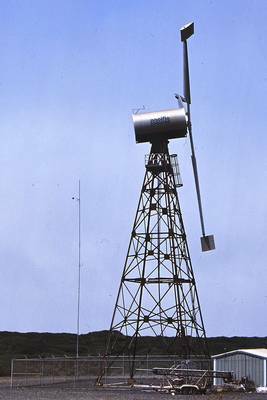 One of the home-built wind turbines in the video was near Canyon and I have a couple of scanned images of the slides I took of that device. I remember using images of it in my slide programs I gave in the early 1980s. Knowing what I know now it would be interesting to look at the dates of some of the wind turbines mentioned in the film. Ok, I couldn't resist. GE's Mod-1 (yes, that GE) was installed above Boone, North Carolina in 1979. It was already derelict in 1981 and shortly thereafter removed. There was a lot of "We told you so" at the time. GE's Mod-1 logged 0 (zero) operating hours. It never got past its shakedown period. I have no record of it logging any generation, though it must have produced something. The Mod-0A turbines in the film were all also removed in 1982. The WTG turbine at Cuttyhunk also had a checkered history. It was clunky, but it did work. 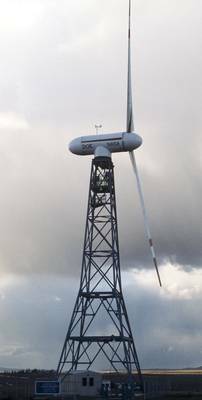 It too was eventually removed as was its sister turbine on the Oregon coast. There's also rare footage in the film of stacked Darrieus or eggbeater wind turbines above a newspaper in Florida. At one time I remembered the name of the architect promoting the concept, but that was long ago in a land far away. . .
Stewart Russell's sharp eye caught that the film had been posted to the Internet Archive and saw that I was mentioned in the credits along with a list of then illustrious names in wind energy. I must have somehow helped the film crew for them to list me alongside Frank Eldridge and Carl Wilcox. Eldridge of Mitre Corp had published one of the seminal works in English reviewing wind energy's state of the art in the late 1970s. Wilcox was one of the last surviving members of the crew that worked on the Smith-Putnam project. You can find images from Wilcox's archive at Smith-Putnam Industrial Photos. Russell commented on the film and that comment got picked up by Brent Summerville at Applachian State University and his comment made its way to FaceBook where it came across my feed. Summerville's post on FB includes a stunning professional DOE photo of the Mod-1 looking down on the nacelle as it was being assembled. That photo is a collector's item. The video can also be found on YouTube. "This program looks at the history and uses of wind power, used for centuries by humans to move boats, pump water and grind grain including discussions on efficiency, problems in the urban environment, experimental systems and windmill use across the United States."